Not satisfied with your life or looking to be inspired in your business/daily life or looking forward to start/expand your business? Look no further. 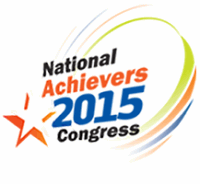 Introducing, National Achievers Congress (NAC) 2015, an inspiration, motivation, business opportunities, investments, wealth creation & wellness events, which will be coming to Kuala Lumpur in July 2015. The motto for this year event is Courage to Succeed – Start Where you are and Go Where you Dare to Dream. Similar to NAC 2014, this event will feature many top international speakers. This year, Lizzie Velasquez will be the featured speakers. Hear her stories and be prepared to be inspired. Lizzie Velasquez was born with a rare condition which doesn’t allow her body to accumulate fat. When her interview aired, she became the target of cyber bullies who labeled her the “Ugliest Woman in The World” at 17 years old. From the “World’s Ugliest Woman,” she becomes the World-wide inspiration. How did she do it? Today, she is a best-selling author and of the documentary based on her life, “A Brave Heart: The Lizzie Velasquez Story” which chronicles her life from bullying victim to a motivational speaker and activist. Lizzie travels the world inspiring and educating the world about the meaning of true beauty. Her story will move you, her bravery will inspire you, and you will never define yourself the same way again. This is an inspiring and motivating 3 days seminar you can’t afford to miss! Meet Lizzie and other world-class speakers like Gerry Robert, JT Foxx and more in person in Malaysia from 10th – 12th Juy 2015 at MIECC – THE MINES. Also meet Koji Ikematsu an international businessman, philanthropist, motivational leader, and professional extreme sports athlete and Pip Stehlik an international speaker, top trainer, and property investor. What you will learn throughout the event? To be inspired – Discover ways to find fulfilment in your life by dreaming big, contributing to a cause greater than yourself, and living a life according to your design. Financial Education – Learn the most effective ways to make your money work harder for you (instead of working hard for your money). Systems for Success – Develop skills in business and leadership that will be practical for you. Learn sales and marketing tools, how to motivate and develop your staff, and generate more profit with cutting-edge strategies. Investment Opportunities – Find the asset classes that will work best for you – property, stocks, commodities, Forex, and how to leverage them for maximum profit and minimum risk. Visit NAC Malaysia to redeem your tickets! To find out more, call Amanda @ 6016-2133855. Enjoy this limited time offer which only valid till 3rd June 2015.